California law sets forth a list of factors for courts to consider when issuing an order of spousal support as part of a divorce judgment. These guidelines govern marital dissolution proceedings in San Diego courts and throughout the state. It is important for divorcing couples to understand that the amount of spousal support ordered, if any, is subject to the facts and circumstances surrounding your case. A family law attorney with extensive experience handling divorce matters would be able to give parties a good picture of what to expect at every stage of your family law case. Once a spousal support order is issued, one party or the other may seek to modify that award at some time in the future. The moving party is expected to show a “material change in circumstances,” supporting the need for the requested modification. California case law suggests that courts considering whether or not to modify a spousal support order must review the same criteria it uses when setting the amount in the first instance. Under Section 4320 of the Family Law Code, courts will look at factors such as the earning capacity of each party, the ability of the supporting party to pay spousal support, the supported party’s marketable skills, the respective needs of each party in accordance with the marital standard of living, the assets and obligations of each party, and the length of the marriage. In a recent case, In re Marriage of Baysinger, the court declined to review the ex-wife’s request to modify spousal support, finding that it lacked jurisdiction to do so, and even if it did have jurisdiction, the wife failed to present any change in circumstances since the last order was issued. Here, the parties were married in 1982. Their marital status was terminated in February 2005. The court retained jurisdiction over the issue of spousal support, but none was awarded at that time. Five years later, the ex-wife filed a motion with the court seeking $600 per month in spousal support. The husband contested that request. In June 2010, the court awarded the wife $200 per month until January 2013, at which time she would begin receiving Social Security and the court would no longer have jurisdiction to act on the matter. While the ex-wife did not object to the decision, she filed for modification of spousal support on December 31, 2012. The trial court denied her petition, concluding that it did not have jurisdiction to hear the matter, nor did she cite a change in circumstances to support the request. The ex-wife appealed. The court of appeals affirmed the decision, noting that the record supported the lower court’s conclusion that the ex-wife proved no material change of circumstances that would warrant continued support. Furthermore, the court concluded that it did not need to address the ex-wife’s claim that the court erred by ruling that it had no jurisdiction to review the modification request, since the court clearly stated that she failed to identify a change in circumstances since the last order. While this is an unpublished opinion in the state of California, the court’s conclusions could still serve to inform later cases in this jurisdiction. The decision nicely illustrates the need to consider the unique facts and circumstances of each family law case when determining each parties’ rights in divorce proceedings. 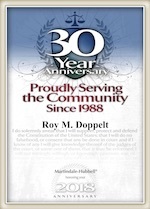 Roy M. Doppelt has been representing parties in family law matters for more than 20 years. Doppelt and Forney, APLC serves clients throughout Southern California, including San Diego, Encinitas, La Jolla, and Chula Vista. For a free consultation, contact Doppelt and Forney, APLC through our website, or give us a call toll-free at (800) ROY IS IT (769-4748).